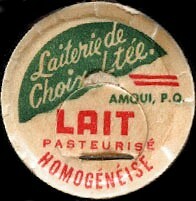 The ministry of Public health of Quebec issued that as from May 1, 1957, all the milk sold in all the public establishments of the province, was to be pasteurized. At this point, Mr. Auguste Ruest (still living in Amqui and will be 83 years old on May 6, 2003), already owner of a restaurant since 1952 (The Ruest Coffee) in Amqui, decided to join a friend, Mr. Ernest Deschênes of St-Quentin N.B. (of which the company: Deschênes Drilling, specializes today in the drilling of artesian wells) to start and operate a dairy in Amqui which will be located on road 132. 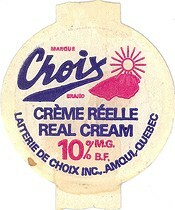 It will be known as "De Choix Dairy Inc". 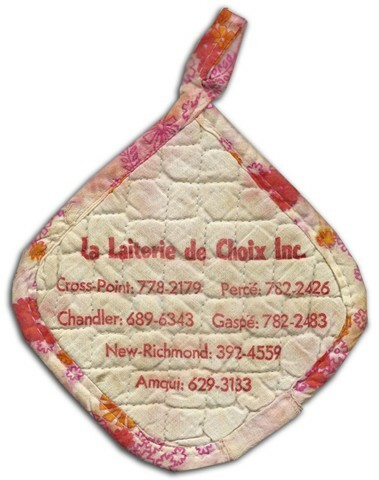 This name had been selected out of a public contest directed by Mr. Jean-Marie Paradis of Amqui. 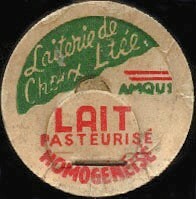 In 1958, three milk routes were bought to constitute the first volume of the business. In chronological order, it was the milk route of Mr. Laurent Perron, the one of Mr. Charles Boulianne, which mainly supplied the Ste-Ursule Teacher Training School and the milk route of the two brothers, Marcellin and Arthur McNicoll, whose market was mainly located within the limits of the Amqui city. A Volkswagen wagonnette was then used for the first deliveries. A Willys Jeep was also used for the most difficult days in winter, when roads were bad! The distribution of milk had been entrusted to Fernand Ruest, the brother of Mr. Ruest, which is now retired in St-Anaclet-de-Lessard. At that time, milk was sold 18 cents a quart plus 10 cents deposit for the bottle. In 1960, Mr. Ruest acquired all the shares of his partner Mr. Deschênes. 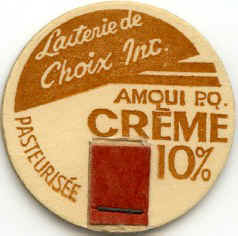 Then in 1962, he acquired a small distribution center located at Grande-Rivière in Gaspésie. 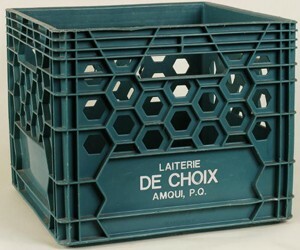 This distribution center belonged to Mr. Paul-Emile Giroux, resident of Ste-Thérèse-de-Gaspé, which was then distributor for the "Gaspé Dairy" wich closed later because of the arrival of the "De Choix Dairy Inc". De Choix Dairy was able to supply this area all year long with fresh milk while Gaspé Dairy saw its provisioning being dried up in winter, because the producers in this region were not producing milk! 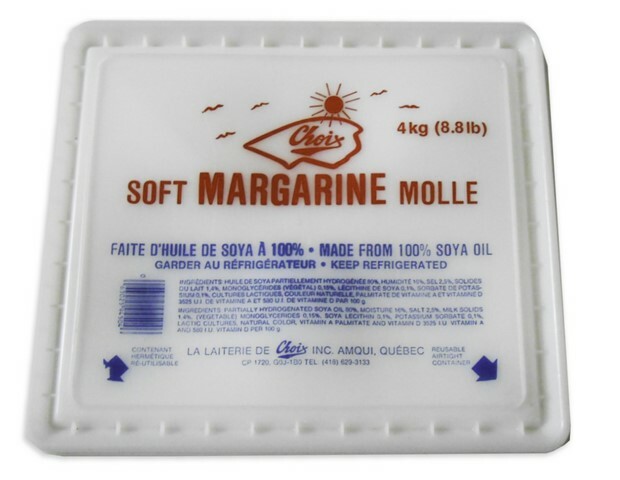 At winter time in Gaspésie, the population consumed the strongest percentage of powdered and canned milk (Crino and Carnation) of all Quebec. We can say that because of lack of fresh milk! Therefore a milk route was opened in Causapscal and in Carleton. In 1965, another milk route was opened to deserve the Gaspé area. In 1970, all the milk routes of the "Gray Velvet Dairy" in Campbellton N.B. were acquired just as the operations of the Oak-Bay Dairy Farm in Oak-Bay. The "Oak-Bay Farm" was owned by a religious community responsible for the management of the Campbelton hospital. Oak-Bay is a small community located East of Pointe-à-la-Croix. 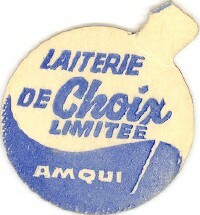 Thereafter, the Matapédia Dairy of Sayabec, property of the lawyer Louis-Philippe Rioux, also known under the name of "The Valley Dairy", was acquired by Mr. Ruest. Today the building is occupied by a spare parts automobile store, carrying the "Car-Quest" banner. 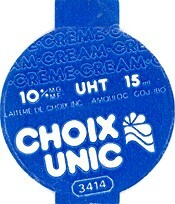 In 1974, "De Choix Dairy Inc." changed name for: "Choix-Unic Group Inc." the change took place immediately after the purchase of the "Unic Dairy Ltd" property of Aurel Joncas' family, which was the founder; the closing of the Matane Dairy bought by Purdel (Le Bic) and a strike (in summer 1978) at the Pasteur Dairy, property of Purdel (Rimouski). Then "Choix-Unic Group Inc." occupied Bas-St-Laurent area up to Rivière-du-Loup and was able to penetrate the north coast of Gaspésie. Thereafter, "Choix-Unic Group Inc." decided to penetrate the market of the northern coast of the St-Laurent : Bay-Comeau, Forestville, Port-Cartier and Seven-Islands for finally extending to the Basse-Côte-Nord, Anticosti and Fermont-Wabush. 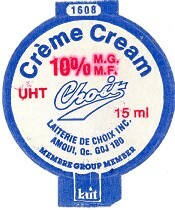 It is with the acquisition of the "Trudel Dairy" of Hauterive in 1979, which was also coveted by Purdel, that "Choix-Unic Group Inc." definitively took root on the "Côte-Nord" area. Today, the milk factory of Amqui became the property of NATREL (Subsidiary of AGROPUR). The factory of Amqui is still directed by one of Mr. Auguste Ruest son, Ghislain Ruest. 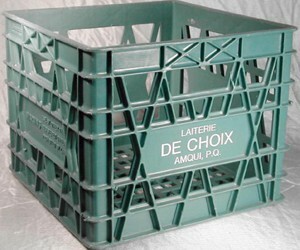 It specializes in the pasteurization and the distribution of milk, and manufactures the cheddar and the well-known cheese "Le Petit Gaspésien". However, Natrel ended the production of some famous products as the famous Salted Tortillon cheese, drinks in mini sachet "YOUP" and the UNIC ice cream. This famous dairy ice cream, top-of-the-range, known under the name of "Gaspésienne" dairy ice cream was launched on the market on the initiative of Mr. Gaétan Ruest. It was the first variety in the world containing maple sugar cracks.
" 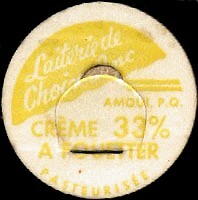 La Gaspésienne " ice cream. The territory of "Choix-Unic Group Inc." extends today on the St-Laurent north coast from, Tadoussac to Natashquan while passing by Forestville, Bay-Comeau, Port-Cartier, Seven-Islands, Fermont, Wabush and Anticosti and also serves all the great area of Gaspésie including the cities of Matane, Cape-Cat, Ste-Anne-des-Monts, Mont-Joli, Amqui, Ste-Luce, Rimouski, Rivière-Bleue, Rivièrre-du-Loup, Cabano, Dégelis, Ste-Anne-de-la-Pocatière, St-Jean-Port-Joli, Pointe-à-la-Croix, Carleton, New-Richmond, Paspébiac, Chandler, Grande-Rivière, Percé, Gaspé and "Iles-de-la-Madeleine". NATREL Amqui is now the only factory to pasteurize and distribute milk in all the East of Quebec! Son of Mr. Auguste Ruest, the founder. Thanks to Mr. Ruest !